Recently the NY Times ran an article about lower sales of children's picture books as parents worried about their children's performance on tests pushed them to read chapter books at an earlier age. Naturally this has caused heated conversation in our household and also among our friends here in Park Slope, the breeder capital of New York City. Because we want Willa to be as prepared as possible we've decided to skip chapter books and have her start reading catalogs to better understand merchandising, product presentation, and outfit matching, so she can outperform her peers in what is sure to be stiff competition for sales associate and retail concierge service jobs. Recently she has been concentrating on learning the names and likes of the models in the Boden catalog, and we have friends whose slightly older child is reading the descriptions and watching product videos on the B&H site to get ahead with electronic retailing. But even this type of reading requires the same kind of dedication that young Laurence Gignac's mother showed when she said, “He would still read picture books now if we let him, because he doesn’t want to work to read," so when Willa starts making up tales about young Jana and Isadora we steer her right back to the item descriptions, material lists, and prices. By the way if anyone has any catalogs in Mandarin to spare think of us. 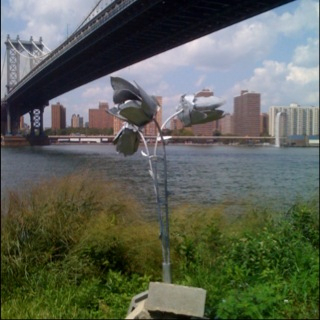 Really nice article in a new blog called The Greenest, about my wife Bryony's "nanofarm" installation at The Old Stone House Park in Park Slope. Tonight we will be eating the mustard greens that were growing on one of the lampposts. The Coop tees got a tremendously nice compliment from the genius snarkmeisters of Fucked In the Slope. I love their blog though I am a stroller pushing coopretard and for now (probably until they read this) they are my new blog bffs too. I think the Suspended at The COOP line could break out. I've added some kids sizes and a tote bag. New Shirt up on Definitive Tee's. Also slightly Park Slope Food Coop oriented but really who doesn't love Kombucha? Available in brightly colored small sizes and onesies too. Profits (if any?) will go to hunger relief and not my growing habit for the sweet-tart tea. Inspired by the invisible mark of shame felt by the author of last week's ridiculous NYT essay on the Park Slope Coop, I've decided to make some t-shirts that reflect a member's status. Buy and wear them proudly. Each shirt is carrying a $5 commission on top of spreadshirts charge to me, 100% that will go to a local hunger relief charity. Bryony's installation "nanofarming" opens tomorrow night at The Old Stone House, as part of the Brooklyn Utopias show. The nanofarm is cultivating a variety of vegetables in the containers that are attached to the four lamposts ringing the green. In a few weeks a second phase of the show that documents the long history of nanofarming in Brooklyn will open at the Brooklyn Historical Society. The project is influenced by the fact that during WWII more than 40% of the produce consumed in the NYC was grown in Brooklyn. Saw this box on the corner. Skaller lost the primary yesterday but perhaps I'll remember this in a few years. This is a case of several odds bits converging in to something a bit more. On our way home tonight we passed a notice that Vintage Baseball will be coming to the new ball fields in the park behind The Old Stone House on Sept 13. Around town several teams, of what really need to be called sporting reenactors, play baseball as it was played back in the 1860's. They catch barehanded, dress in vintage costumes, and bring period fans. I'm calling them sporting reenactors because unlike civil-war reenactors the outcome of the games is undetermined. The funny thing is that just the other day I read an article, in a free local magazine called Overflow, about the Gowanus Improvement Company Headquarters, the derelict and landmarked mansion on 3rd and 3rd. The author mentioned the fact that Charles Ebbet's' National League Baseball Team (later called The Dodgers) played their games from 1898-1912 on the same fields in the park just across the street. The fields are astroturf, and the hotdogs filled with things not invented back then but it looks like a lot of fun. We spotted the car of one of our favorite restaurants parked in this seemingly custom parking spot on Third Avenue. Until some of the SMART car owners up in the Slope decide to risk parking their little bright cars down the hill, the owner of the ChipShop should be able to park his tricycle here on a regular basis. We love the ChipShop, because of the food and not just because it is around the corner, and we've recently discovered a great trick for ordering there. Get a child's size portion; plenty big, you'll have room for a pudding, and it won't send you off hungry or feeling ill. If you go before 6:30 there is also a discount. I used to think that the sea lions at the Prospect Park Zoo had an okay life, that is an okay life for an animal kept in a zoo, but yesterday seeing them surrounded by hundreds of kids making sea lion noises sounds was a bit jarring. They seemed to be in hiding. There must have been at least twenty school groups there. It wasn't the outing I had in mind, so Willa and I left after checking that no sea lion had become a stowaway. Last night at blogfest I found out that FlatbushGardener used to live in our apartment. We had been getting the occasional piece of junk mail addressed to him and I wondered why so I got to use last night's event to ask. Small world. His blog has long been one of the best gardening and urban nature blogs around and it first caught my eye when I was running GardenWeb and creating the GardenVoices reblog. We were both blessed with getting to look out on, and care for, the garden that our landlord built years ago. From early spring through late fall we eat most meals out on the deck that overlooks it. The garden lightens our days and even makes things like an oven that sets off the smoke alarm trivial. I also found out that he had planted some columbine which you can see flowering along the wall on the bricks along the wall on the right in the photo. You can also see a close up of them in a photo on his blog that was taken in from 2004. One day we will move on from this apartment too and maybe it will lead to a surprising connection. BedStuy Banana - the leading BedStuy blogger has walked her entire neighborhood. 174 miles in total. What a way to get a feel for your beat. OTBKB is having breakfast with all of the candidates for the 39th District City Council seat. Her posts give their backgrounds, and q&a. A fine example of local news gathering. Parking is tight in Park Slope. What at first seemed like a great thing, a dream really of not having to move cars at all, is turning out to be more of a burden. There seem to be no spots on days when there usually are which makes me think people have driven up from other areas of Brooklyn and are parking their cars. Anecdotally there were two members of my COOP squad were very late last night because they had been circling around for over half an hour looking for a spot.The lack of movement also leads to sloppy parking with odd sized gaps forming people have no incentive to tighten up. The streets are dirtier. The high winds last week kicked up big clouds of dust and paper. Overall it makes me even more of an advocate for permit parking which I was hoping would come in with the congestion pricing proposal that the Mayor tried to put forward. Permit parking would open up spots, it would make all of the people with out-of-town plates register their cars and pay NY insurance which in turn could cause lower rates. All in all it would be more fair. So as the weekend looms it is a real question in my mind whether to take the care out of its spot.